During World War II, British and Commonwealth armies used a vast number of small sized, fully tracked weapons carriers, chief among which was the Universal Carrier Mk.II. The compact, open top vehicle served in a variety of roles on the North African, Italian and West European fronts. A number of variants were constructed, including models	mounted	with mortars and flamethrowers	however, most machines typically carried a Bren light machine gun. Over 65,000 models were manufactured in Britain, Canada and other Commonwealth countries, making it one of the most numerous armored vehicles built during WWII. Special Feature 1 Length: 80mm. Special Feature 2 The model depicts a carrier from the 2nd Bttn., Kings Shropshire Light Infantry, 3rd Infantry Div. Europe. Special Feature 3 One driver figure included. Special Feature 4 The model comes with high quality pad printed markings and decals pre-applied. Special Feature 5 A light weathering is applied to enhance the realistic appearance of the model. 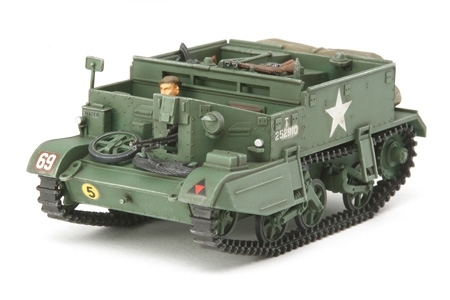 Special Feature 6 Spin-cast metal weight adds a greater sense of volume to the Universal Carrier Mk.II.